Milk chocolate, coconut and almonds make a classic combination that's bound to remind you of the beloved candy bar known as the Almond Joy. This low-carb version will bring out the kid in you. 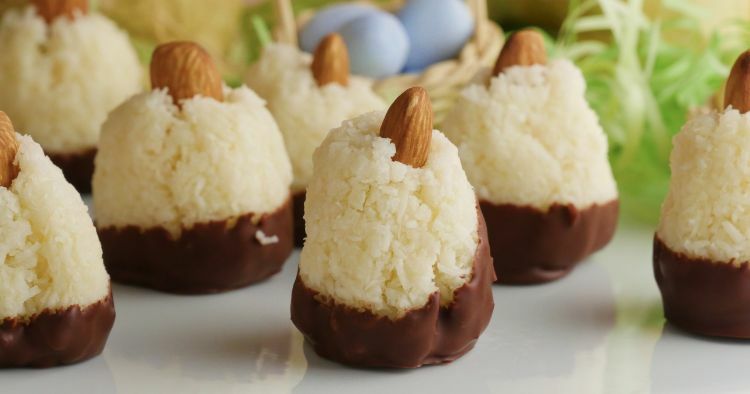 The fun, chocolate- coated eggs make a tantalizing item to put in your low-carb Easter basket or add to a festive dessert platter for Easter brunch. You say you were always more of a Mounds kid? Not to worry, leave out the almond and use dark chocolate for the coating. Or coat the eggs in dark chocolate and pipe milk chocolate onto the eggs in decorative patterns. You could also use melted cocoa butter with pastel food coloring to add a bit of seasonal color. In a medium saucepan, heat the cream over medium heat until it comes to a simmer. Let simmer for 2 minutes. Remove from heat and stir in the Swerve and coconut. Let stand for about 10 minutes, until the mixture thickens. Using a cookie scoop or a spoon, portion out 10 scoops of dough and place them on the prepared baking sheet. With your hands, form each scoop into an egg shape. 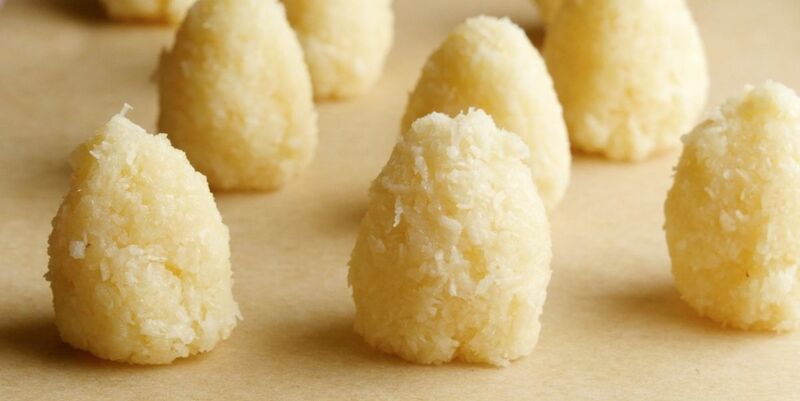 Press one almond onto the top of each egg. Place the baking sheet in the freezer. Let the eggs set for at least 2 hours. In a microwave-safe bowl, combine the chocolate and cocoa butter. Heat in the microwave in 30-second intervals, stirring in between, until the chocolate and cocoa butter are completely melted and combined. Dunk each of the frozen eggs into the chocolate mixture, using a fork to lift it, and let the excess chocolate drip back into the bowl. Return the coated egg to the baking sheet. Once all of the eggs have been coated, let stand at room temperature for about 20 minutes, until the chocolate coating is set. Serve immediately or store in the refrigerator for up to a week, or in the freezer for up to 3 months. Share this chocolaty Easter joy on Facebook.